For most people, an afternoon at the airport before a flight often means long lines and a lot of waiting. Not for Brooks Lodge-bound visitors at Katmai Air in King Salmon, thanks to BBNC shareholder Teresa Capo. Capo is Katmailand’s official “Cultural Presenter.” Her job is to share her passion for Native Alaska culture and her in-depth knowledge of the Bristol Bay region—specifically plant life—with guests heading to Brooks Lodge, now owned by BBNC as part of our 2016 acquisition of Katmailand, Inc. She works at Katmai Air six days a week during the tourist season, giving multiple presentations each day. But these are no ordinary presentations—Capo takes her role as Cultural Presenter even further. She shares lively stories about our region and anecdotes about her own family (a favorite is the one where her mother would travel from village to village by dog sled to visit friends). Capo also explains in detail how plants in the area are utilized for both food and medicine, using first-hand experience and her education as a UAF Distance Learning Classes Rural Human Services (RHS) and Alutiiq language student to bring this information to life. 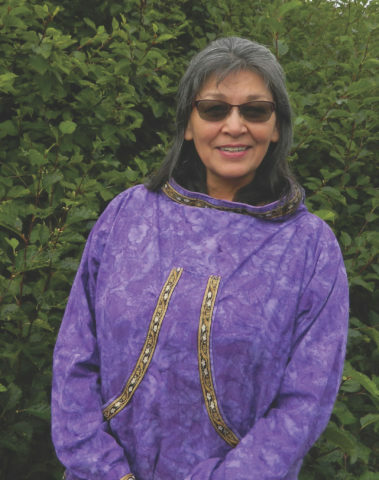 She even sings traditional Alutiiq songs, performing them in the waiting area of Katmai Air to delighted audiences; songs learned during Capo’s time as part of an Alutiiq dance group. For many of these out-of-state and international travelers, Capo’s presentation is their first real exposure to Bristol Bay’s land and culture—and to the vegetation that is such an important part of both. BBNC thanks you, Teresa, for representing our shareholder community, and our region, in such a special way!